Running an online business is a bit of a balancing act. There are so many things to optimize, marketing strategies to implement, and social channels to explore that it can be tough to ensure that you are expending the right amount of effort in the right places. The solution, of course, if to look at your business data and figure out what has been working, and where improvements could be made. However, the raw data may not be all that helpful on its own, even if you are using a platform that helpfully tabulates it all for ease of interpretation. Furthermore, individual datasets may not tell you enough on their own to enable you to make effective decisions for your business. Naturally, this is where web analytics come in. Using a series of highly specific mathematical methods, designed to provide specific insights based on your data, analytics are essential for effectively optimizing your website, pinpointing weaknesses in your marketing strategy, and highlighting shifts in consumer habits. Each metric measures a particular type of data, which can then be analyzed in the context of your business. However, while there are countless factors you could track and interpret, it is important to focus on those metrics which can be used most effectively in the analytical models that inform the direction of your business. For example, it can be helpful to know the number of page views your site is receiving, or the number of visitors. However, by reviewing those two datasets in tandem, it is possible to extrapolate the average pageviews per visitor. Combine this with bounce rate data, traffic volume, and details of sites referring visitors to you, and you begin to paint an even clearer picture of your site visitors and their typical behavior. While it is often possible to gauge trends in data by eye, applying mathematical methods to interpret your data allows you to confirm those trends, as well as determine their strength, and potential to continue. Ultimately, the value of web analytics is that they enable you to extract statistically significant insights from raw data, answering vital business questions, and enabling you to make informed decisions based on mathematical predictions. Search terms – these are the keywords and phrases that visitors have used to find your website. This can help you determine which words and phrases are already working for you, and where to focus your efforts to increase your ranking for other keywords that you are targeting. Referral paths – this enables you to identify where your referral traffic is coming from. Perhaps you have guest-posted on an influential website, in which case you can learn from the success of that piece of content. You may even gain traffic as the result of a recommendation on another site, that you were formerly unaware of. If so, this discovery might prompt you to contact the site owner and discuss the potential for collaboration. Visitors – this covers both the tally of unique visitors, insofar as it is possible to identify them, as well as the overall number of visits including those who return to your site after their first visit. Keep in mind that there is no reliable way to tell if someone has visited your site multiple times from different browsers or devices, and this can skew your figures. Page views – this can help you establish the popularity and success of a given page, as well as the ease of navigation to that page. You can track the average number of pages viewed in a visit, as well as the number of times a particular page is viewed in a single visit. Bounce rate – your website’s bounce rate refers to the percentage of visitors who leave with just one page view. That is, they land on your site, and bounce right back off it. If you combine this information with details of the typical exit pages, you can begin to identify what it is about those pages that causes people to leave. Conversions – when a visit leads to a sale on an ecommerce site, this is logged as a conversion. As such, tracking which pages result in the most conversions, as well as which entry methods seem to drive the most sales, you can learn a lot about how to encourage future visitors to make purchases themselves. Exit Pages – an exit page is whichever page a user was browsing when they decided to leave the website. However, it is important to keep the functions of these pages in mind when interpreting the data gathered. For example, if your lead capture form has a high exit rate, then you probably need to work on its format and wording. However, if your most popular exit page is the order confirmation screen, this just means users have made a purchase and left the site. Of course, there is no reason not to explore ways to keep customers on the site after completing their purchase, but at least you know that your sales funnel is working well. It’s all very well knowing which metrics to track, and learning how analytics methodologies can be applied to them. However, the first thing you need to do is gather the data. Fortunately, there are a range of business tools that make this part of the process fairly straightforward. As mentioned earlier, many ecommerce platforms include functionality for tracking popular metrics, and applying analytics to their findings. You should also try out Google Analytics and possibly even Pinterest Analytics. 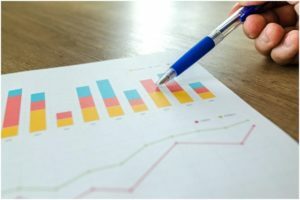 These tools will give you a good basis upon which to build your analytics strategy, and can continue to be useful throughout your business endeavors. In general, it’s very easy to integrate popular business tools such as Google Analytics with your ecommerce platform, so you can keep all of your data and associated findings in one place. If you’re using Shopify, for instance, you simply go to Analytics, enter your domain, click ‘Get Tracking ID’, then paste this ID into the Google Analytics account field on your dashboard. Keep in mind that you can not only implement web analytics on your website, but also use these methods throughout your social media channels, to gauge the performance of your content and B2C interactions. The more metrics you track, the more datasets you will have available for analysis, enabling you to expand your analytics initiatives further and learn more about your business and its customers. However, while it is sensible to gather as much data as possible where it doesn’t impact your costs, you should not feel that you need to track every conceivable metric, unless you feel it would be of benefit to your business. Focus on developing an analytics strategy that covers the core requirements of your business plan. From there, you can always branch out and explore other areas you can research, track, and optimize. In the meantime, you will be continuously gathering valuable insights, and enhancing your understanding of both the analytics process, and the answers it provides. Related reading: 5 Directories Your Business NEEDS to be Listed On.